Acupuncture is one of the the oldest continually practiced forms of medicine in the world. The World Health Organization recognizes its' effectiveness for over 100 health conditions1. This includes various chronic pain syndromes and neurological conditions. Acupuncture theory holds that energy conducted by meridians known to coordinate the balance between one's spiritual, emotional, mental, and physical states. Today, Americans make as many as 12 million visits per year to acupuncture practitioners. Many people who have experienced acupuncture report relief from pain and a sense of euphoria or well being. Dr.White, Dr. Carpentier and Dr. Monique White are all certified to practice acupuncture. They have had extensive post-doctoral training in order to practice. 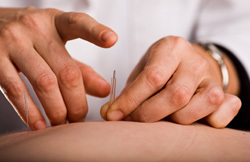 Acupuncture is known to have a profound impact on pain. The theory1 behind this is that the application of fine needles in acupuncture points stimulates the release of chemicals, such as endorphins or opiates, which dull or alleviate pain while releasing hormones, neurotransmitters, and other chemicals that aid in healing or regulation of homeostasis, such as blood pressure. Acupuncture involves the application of extremely fine needles into one or more of the 2,000 acupuncture points on the human body. These points are said to link 12 main and 8 secondary pathways. These channels, or pathways, are called "Meridians" The meridians are believed to conduct energy between the body's skin and internal organs. Evidence has shown that the body's 2,000-plus acupuncture points do conduct electricity, and this flow of current may play a role in triggering the release of helpful chemicals in the body to where they are needed most. 2. Manyanga, Taru et al. “Pain Management with Acupuncture in Osteoarthritis: A Systematic Review and Meta-Analysis.” BMC Complementary and Alternative Medicine 14 (2014): 312. PMC. Web. 27 Mar. 2017.